To see maps, where to stay, photos, and more tourist information, refer to the Denver trip maker app . Topeka to Denver is an approximately 5.5-hour combination of car, flight, and train. You can also do a combination of shuttle, flight, and train; or drive. Due to the time zone difference, you'll gain 1 hour traveling from Topeka to Denver. Traveling from Topeka in June, plan for slightly colder nights in Denver, with lows around 55°F. On the 5th (Wed), you'll travel to Yellowstone National Park. Get in touch with nature at Fishing Bridge General Store and Artist Point. Kids will enjoy Lamar Valley and Lehardy's Rapids. Spend the 10th (Mon) exploring nature at Yellowstone National Park. There's much more to do: witness a stunning natural landmark at Old Faithful, contemplate the waterfront views at Yellowstone Lake, stroll through Lewis Falls, and take in breathtaking views at Grand Canyon of the Yellowstone. 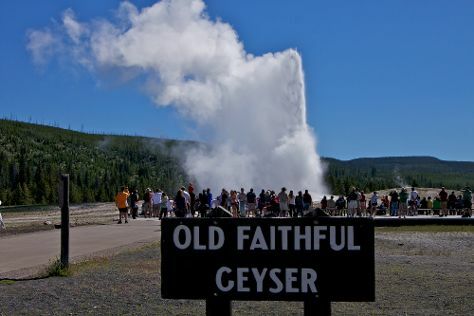 To find ratings, reviews, photos, and other tourist information, you can read our Yellowstone National Park trip itinerary planner . Traveling by combination of train, flight, and car from Denver to Yellowstone National Park takes 5 hours. Alternatively, you can do a combination of train, flight, shuttle, and car; or drive. Traveling from Denver in June, you will find days in Yellowstone National Park are slightly colder (66°F), and nights are much colder (34°F). On the 11th (Tue), you'll travel to Denver. On the 12th (Wed), meet the residents at Downtown Aquarium and then see the sky in a new way at Denver Museum of Nature & Science. To see other places to visit, more things to do, and other tourist information, go to the Denver day trip planning site . Traveling by combination of car, flight, and train from Yellowstone National Park to Denver takes 5 hours. Alternatively, you can do a combination of car, shuttle, flight, and train; or drive. When traveling from Yellowstone National Park in June, plan for a bit warmer days and much hotter nights in Denver: temperatures range from 83°F by day to 55°F at night. Wrap up your sightseeing on the 12th (Wed) early enough to travel back home.